"Limits were made to be pushed. Between Abby’s reluctance and Nathaniel’s unyielding commands, the delicate balance of power between the Dominant and his submissive threatens to shift. 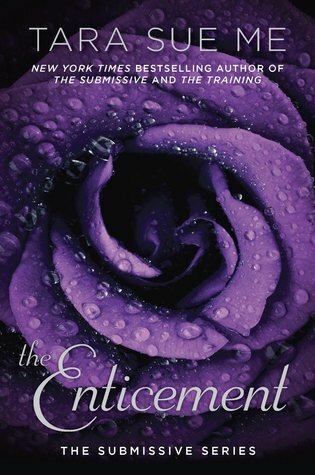 And as the underlying tension and desire between them heats up, so does the struggle to keep everything they value from falling apart …"
All in all, The Enticement is a great read and the steam is off the charts. It’s the perfect blend of romance, heart, steam, and it is a fantastic time. I love love love when I encounter characters whose chemistry is off the charts! It just makes the book so fun to read! And it makes watching the characters interact awesome. I really do need to check this series out! GAH! Oh, I haven't heard of this book/series before. Haha, yeah, Nathaniel doesn't sound like my kind of guy, but you're right, the girl has to deal w/him, not us. Too funny. This sounds fun though. Not my kinda read but I so love the cover. I hear ya girl. It's always nerve wracking when a couple gets another book because you're like NO DON'T HURT THEM! LOL. I'm glad to see that they communicated, even with him pushing her. That's always a plus in my book that you don't get all this drama because of miscommunication, or lack thereof. I'm so glad you enjoyed this one T! You should! Its such a fun series! I love watching the back and forth with Nathaniel and Abby!